Winnie Maneli will be familiar to many TVS volunteers. Now in her 80s, she is a retired head teacher, a good friend to TVS and has followed TVS’ progress over the past 18 years with great interest. We asked Winnie for her reflections on TVS and what has been achieved. Towards the end of 2000 Chief Justice T.J.Mabandla invited me to a meeting at his Great Place. The meeting was attended by retired professional people like nurses, teachers, policemen and community members. A lady from UK, Margaret Woodward, was in the middle of an address. She stated that she was part of a group that wished to reach out to less privileged communities with the aim of developing the education their children were receiving. 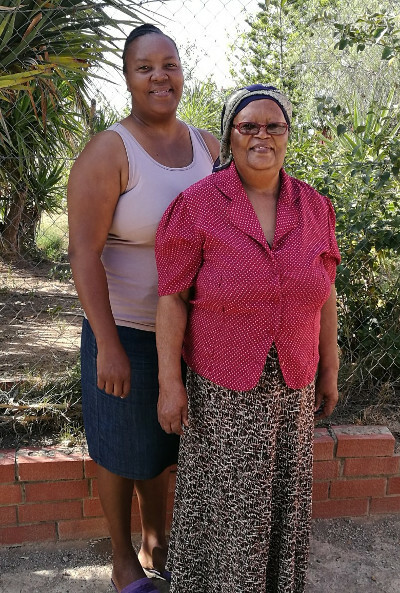 She and another lady from the group were guests of the late Archie Sibeko, who had become a citizen of England after settling there in the apartheid years. The two ladies had visited the local primary school, and were shocked to note the absence of essential resources. They promptly donated a few of these, including water tanks and musical instruments. The Chief was so impressed with the plan outlined by Margaret and the positive response of the audience that he suggested the UK group should consider helping all the schools in the Valley, since poverty was retarding development everywhere. The upshot was to set up a Working Committee to take this vision to the general body of Tyhume teachers when the new school term started. That is how TVS was born; it worked with the Ikhwezi Teachers’ Association made up of all the active educational staff in the Valley. The first project tackled the teaching of five topic areas, including Mathematics, Natural Science and English, that teachers found difficult to teach according to the new requirements of the new post-apartheid education system. Hobbiton Outdoor Activities Centre in Hogsback was used as a training venue and for each topic a UK teacher worked with the relevant subject teachers. This was a new experience for both teachers and learners. A fresh breath of air descended on the Tyhume schools, as the learners could be taken up to Hobbiton, which had previously been out of reach. Tyhume teachers worked closely with UK teachers, and the training was spiced with fun through demonstrations and acting that accompanied the lessons. To crown the project, the Tyhume teachers had to give demonstrations at their schools at the end of the training, to equip the other subject teachers with the knowledge they had gained at Hobbiton. In order to forge closer relationships with local communities, the UK teachers asked for accommodation with local families. What an idea! This was the first time that a white person had wanted to establish that kind of relationship with a black person, and it was quite a challenge. But in the end, the Tyhume people were convinced that change was taking place, and they embraced it. Today, it is gratifying to see a visiting TVS volunteer leaving a village home for school or jogging through the village. Training was extended to Music, Arts and Crafts, Sport (with an emphasis on Netball), HIV and AIDS awareness and Computer literacy. All this entailed supplies of equipment from UK, and it was indeed a hectic exercise for TVS to send a large consignment of Musical instruments, arts and crafts materials and books to the Tyhume Valley. A library was established at Dyamala Primary school. The learners grabbed the opportunity to use the instruments with warm hands! Suddenly, the school days were busier as learners stayed for practice after school. Teachers showed their sewing talents and made items for sale to in aid of school funds. Although the music, arts and crafts projects were not sustained, TVS nevertheless gradually changed the mindset of all the stakeholders - the development was afoot. Several learners excelled in skills for netball; it was always a beautiful experience to see teams dressed in different netball kits donated by TVS and there were new lively associations between learners from different schools. At the same time, a twinning system took place between UK schools and Tyhume Valley schools. This was one of the most effective ways of supporting staff, as the teachers enjoyed a teacher-exchange programme. It was amazing how TVS attempted to halt the scourge of poverty by donating equipment and resources and facilitating the teacher- exchange programme. Teachers gained more knowledge and grew intellectually. They were expected to return to their schools and give demonstrations of what they had learnt. Sadly, funding restrictions constrained the expansion of such a healthy scheme; it was also sad that some Ikhwezi teachers were less committed as they did not pass on to colleagues the knowledge they had gained. Happily, however, efforts to improve learners’ skills in English and IT are still continuing today. Among the TVS volunteers who have stayed in the Valley is Vicky Riley, while Vuvu Tomi and Nontombi Siyanga are employed to train learners in IT. A group of teachers from different schools take part in classes to improve children’s English; this has improved the quality of the English taught in local schools and complements the prescriptions of the national syllabus. Such contributions by TVS are deeply appreciated by parents, because they can see the effects of these new approaches on their children. Study Camps and Workshops are frequent features of the projects, and learners from high schools welcome the study camps as sources of inspiration for them. Professionals have also come to help train teachers in IT and English; schools now have access to laptop computers; and teachers trained with TVS in turn coach the learners. It is a pity that, due to circumstances outside their control, Tyhume people cannot generate funds to take this development a step further. At the same time, we salute the UK professionals for their wonderful input and the impact this has already had on learners’ skills in English and IT. Winnie Maneli with her daughter Primrose.